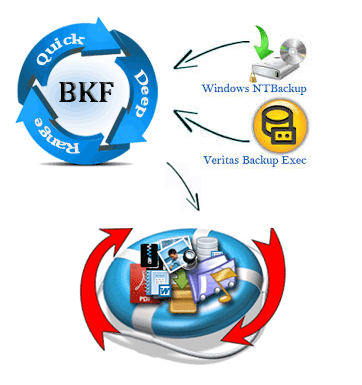 Microsoft has provided in-build Ntbackup feature in Windows XP to create backup of your valuable data. Creating backup of our important data is the safest method to protect our files from data loss situations. If you accidentally delete your files from your system or you face corruption issues then you have backup files in safest side. But if you find that your BKF files are no more accessible then how will you restore Backup files? Software provides three scanning options that is Quick Mode for less corrupt bkf files, Deep Mode for highly corrupt bkf files and Range Based Option provides the flexibility to choose any range of the file and restore only that particular range of BKF File. Software helps to restore windows XP backup files with any type of error. It has the potential to fix any type of corruption and easily restore files. With the help of XP Backup Recovery Software you get the flexibility to save your recovered bkf file at your own desired location. To give an idea about working of the software and how to restore backup we give every user a FREE trial opportunity of the software. With the help of FREE Trial version you can repair and preview xp backup files but restoring file option is restricted in demo version. To complete the final action you have to get the full version key activated.